All About Our Vegetable CSA! CSA stands for Community Supported Agriculture. C.S.A. is a long-standing tradition that has been evolving steadily over the past 50 years here in the United States. 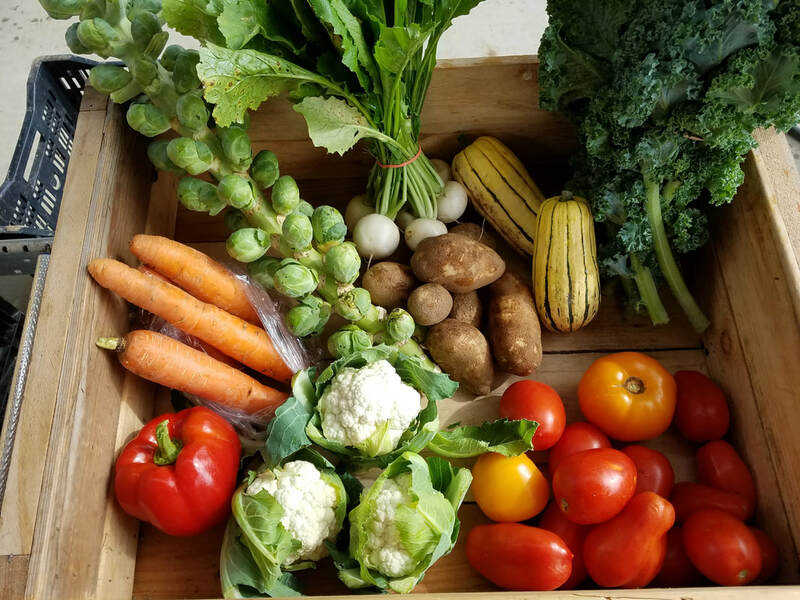 Community members support farms by purchasing a weekly vegetable subscription at the beginning of the season when a farm's expenses are high. There are risks and rewards with this system and each farm is different. 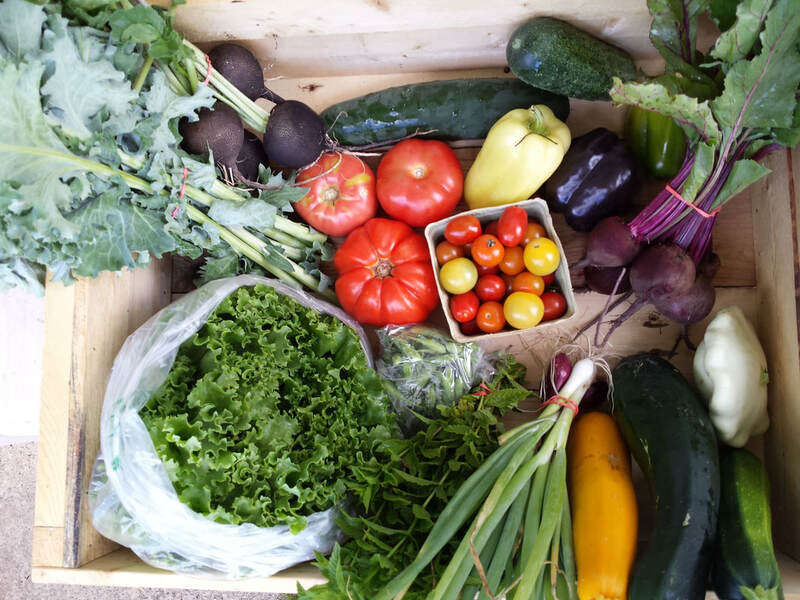 We grow a large variety of over 100 items to fill our CSA boxes all summer long. The timing of the season depends on the weather, but usually begins the third week of June with spring greens, radishes, and lettuces. Later in the summer the boxes get heavier with tomatoes, peppers, zucchini, and carrots. Towards the end of the season you will find beets, potatoes, winter squash and garlic. Each box includes about 10-12 items, which we pack in reusable wooden crates, about the size of a 3/4 bushel box. Which Size Vegetable Share Should Your Family Get? 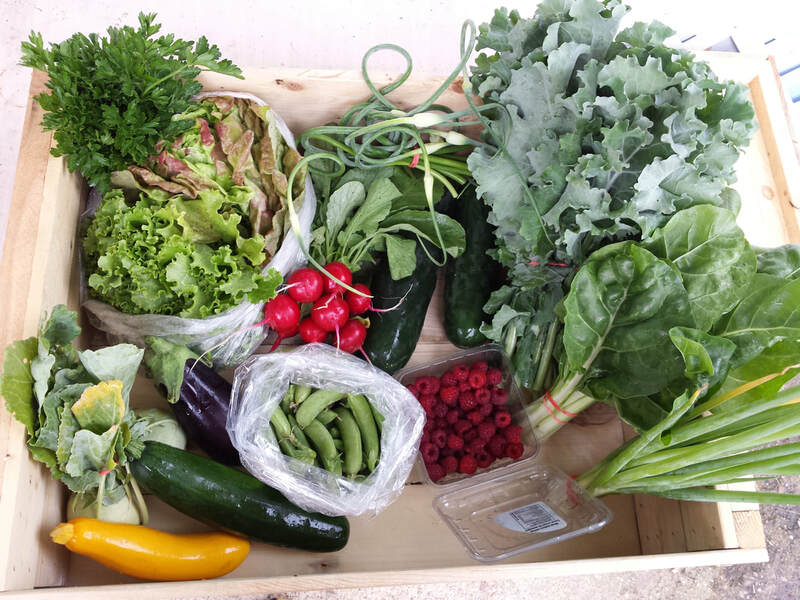 A full share is a vegetable box every week for 18 weeks. Our family of five (two adults and three children) eats a lot of vegetables, and we cook almost all of our meals at home from scratch. We eat a lot of leftovers, freeze excess for later use and do a lot of canning. We consume a box of vegetables every week easily. If this sounds like your family then I would suggest getting the 18 week share of vegetables. If you don’t do all of these things, or maybe you go on vacation, or maybe have just two people in your household, then you should definitely consider getting a box every other week (9 weeks). 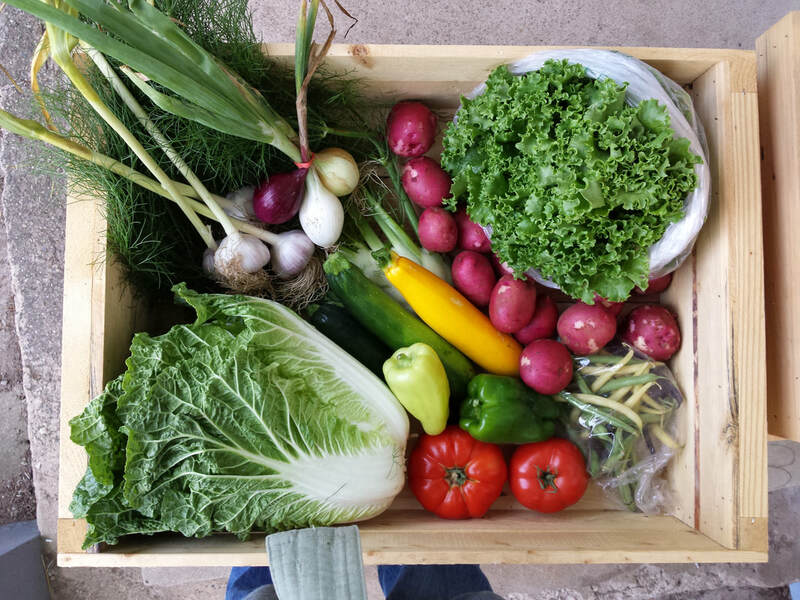 Participating in a CSA can be a big change in the way you prepare food. There is a lot of refrigerated space needed to store the items every week, and a lot of thought goes into how you are going to use up everything before your next box arrives. It takes practice, but over time eating seasonally becomes second nature and at the same time a rewarding challenge. You can decide if you want to pick up your vegetables or have them delivered to your home or other drop off site. Home delivery is only available in some areas, so please send us a message to find out if you qualify. Our delivery/pick up day is Tuesday from 3-7pm. Our hosts sites have covered porches, shaded garages, and air-conditioned buildings. Please remember the items are not refrigerated once they leave the farm, and will last longer if you pick them up ASAP. Refunds: Our farm operates on a fine margin. We do not have the ability to offer refunds for our CSA program. If you are not able to pick up your items, you may let us know ahead of time if you would like to donate your box to the Waupaca Food Pantry. Please contact us as soon as possible if you need to make other arrangements. 1. Please download a pdf of our current sign up form, and mail it to us with your deposit, or full payment. 2. Go to our shop and pay with a credit card. Call us if you have questions. We do add a 3% convenience fee to our online payments. To avoid this fee, follow instructions above.